In honor of the Newsroom Season 2 premiering soon (if you don’t watch it you should!!) a new Sorkinism video was made. So here, I’m sharing both: Sorkinism I and Sorkinism II. 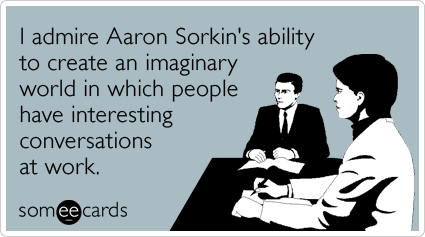 I am a big Sorkin fan and these are quite cool! They are videos showing all the similarities in Sorkin’s scrips in his shows and movies.